Outdoor Evangelism is not a new idea, but has seen renewed interest in the past few years. Many churches have programs like Royal Rangers or Royal Ambassadors, a Boy Scout type program with Bible Devotions added. These outdoor evangelism ministry programs have proven successful at reaching boys whose parents attend church, as well as boys from the surrounding community whose parents do not attend church. Survey and research data show that children who are involved in these programs throughout their childhood are more likely to grow up with high self esteem, remain involved in church activities as teenagers and adults and are even more likely to become involved in full time ministry as Pastors, Evangelists and Missionaries! 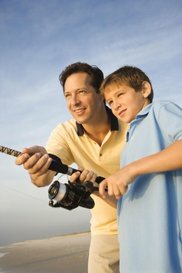 In the past few years there has also been a surge in Christian fishing clubs, hunting clubs, archery clubs and others, targeting adults. Most of these are being sponsored by men's ministry groups in local churches, but there has been a rise in national organizations offering magazines, tours and tournaments. While shopping at one of the larger sporting goods stores one evening, I ran across a group of men who were using the store's facilities, a community meeting room, to have their monthly meeting. They invited me to stick around for the meeting. It turns out that they represented a men's ministry group from a local Methodist church. They were planning their upcoming calendar, which included deep sea fishing trips, deer hunting, etc. Their stated purpose was to invite men in their community to participate with them, giving them some common ground to open opportunities for conversations about the Lord. I made a few suggestions to them as the meeting progressed about how to better reach the men in the community by involving their children. What eventually developed was a successful Saturday outreach event which included outdoor games and activities that the community was invited to, which introduced them to the men's ministry and children's ministry departments in the church. There are many reasons for the success of outdoor evangelism type ministries. One of the biggest keys to success in outdoor related evangelism ministry is the ability to spend time one on one building relationships. When you help someone to succeed at something and make them feel good about themselves, you have gained an audience. They are more likely to listen to whatever else you have to say to them once they know that you care about truly helping them. or any other outdoor related activity, not necessarily using a ball. I will cover those types of outreach on a Sports Evangelism Page in the future. We are also in the beginning stages of a new project called, The Great OutDoors Club Ranch. Click Here for more information.